Military presence in Eastern Visayas is likened to the prevalence of pests in the area — a burden and a pretext to greater destruction of farmers’ crops and even their lives. Following the arrival of the military in each village is always a long list of rights violations and the continued culture of impunity. MANILA — Eastern Visayas is heavily militarized. About 2,100 to 5,600 soldiers are currently present in the region. 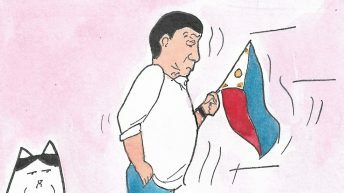 Peculiarly, all this time, more battalions are deployed in a region that covers less than ten percent of the country’s land area than in Spratlys or Benham Rise. In fact, in one barangay, more than a hundred soldiers are present. Upon their arrival in different barangays in Eastern Visayas, soldiers occupy civilian establishments: barangay halls, town clinics, schools, and even churches. “They destroyed even the health center. 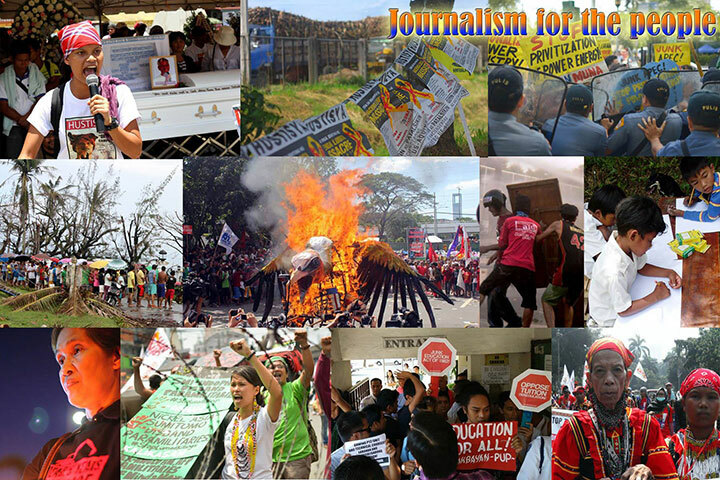 They destroyed the whole barrio,” a delegate of the Eastern Visayas caravan for rights and justice said in Filipino in an interview with Bulatlat. 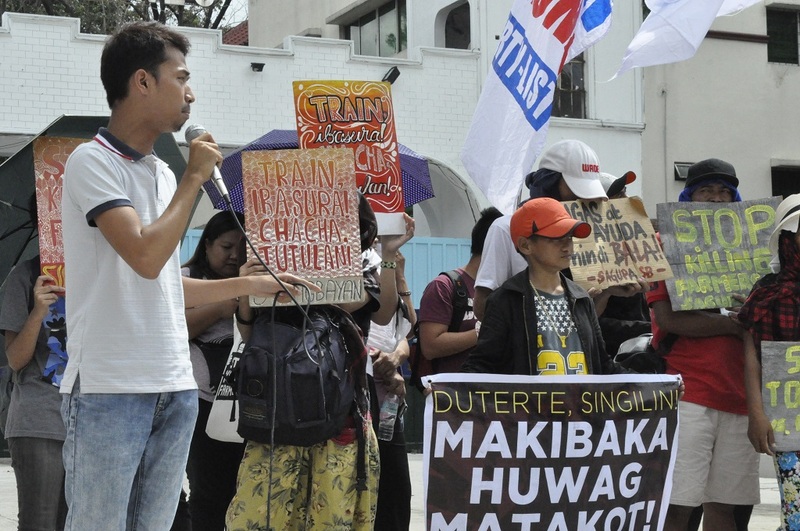 Last month, about 50 farmers from different provinces in the Eastern Visayas region trooped to Manila to demand aid from the government amid the continuous ravaging of typhoons and other natural calamities in the region, and for an end to militarization. One of the delegates (name not disclosed for safety reasons) who lives in Las Navas, Northern Samar said that farmers are forced to leave their crops and livestock when the military conduct counterinsurgency operations. 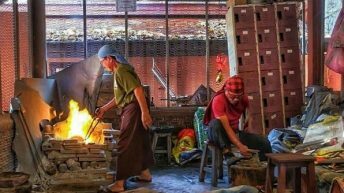 “We are already poor, they are making it more difficult for us because of what they do,” he said. Often, farmers also get accused of giving rice to members of the New People’s Army (NPA), while some are accused of being NPA guerrillas if they did not possess or have an identification card upon inspection. Others get tortured, harassed, or hurt for denying such accusation. This is what happened to Carlito Badillo, a 41-year-old farmer from Western Samar. On November 10, 2017, Badillo was on his way home after sending his children to school when members of the 87th Infantry Battalion of the Philippine Army (IBPA) forced him at gunpoint to ride a white car. He was brought inside a room and was accused of being a member of the NPA. The soldiers slapped his face with a slipper, punched him in the chest and threatened to kill him. After being forced to sign a paper, the contents of which he did not understand, he was detained in the Marabut Police Station and charged with rebellion and illegal possession of a firearm. The following day, he would be charged with illegal possession of explosives. Military occupation of public places – a violation of international humanitarian law – sows fear among the civilian populace. Because even schools are occupied by the military, the youth are also deprived of the use of classrooms, and, consequently, their right to education. According to a delegate, one of her children could not be able to go to school anymore after the military occupied it. “Even the principal cried. They established the school so that local residents will be able to study there, but the military destroyed it,” she said. Delinquent military conduct has also put the lives of local residents in danger. In once instance, soldiers got drunk inside a barangay hall. When a farmer passed by the building, a soldier hit the former in the head with the bottle of an alcoholic beverage. The farmer would receive death threats afterwards, and would be promised a certain amount of money as long as he did not file charges. “We are the ones who till the land but we are being killed because the government turns a blind eye on the conditions of the farmers. All they want is the harvest. They do not care if we die,” he said in Filipino. 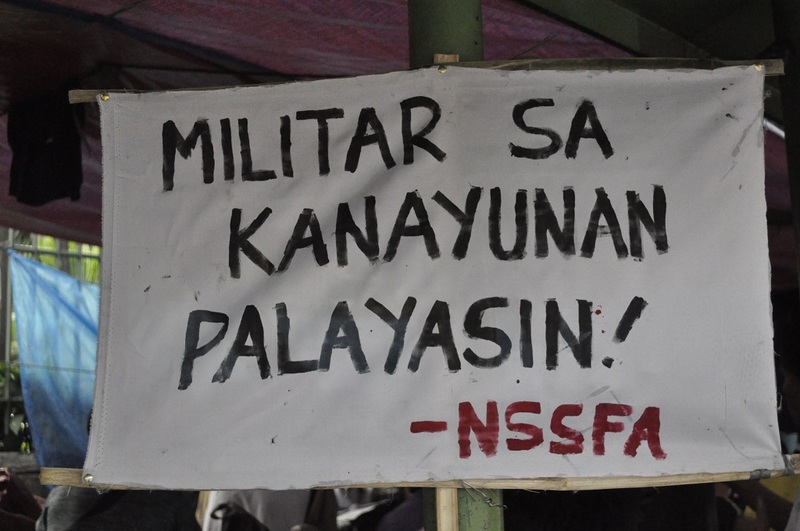 The emboldened presence of the military in Eastern Visayas also hampers the work of human rights defenders. When three farmers were abducted by elements of the 20th IBPA on November 25, 2017, human rights workers went on a search. The following day, Katungod Sinirangan Bisayas (Katungod) leader Sargie Macallan, one of the human rights workers searching for the three abducted farmers, was brought inside the camp of the 20th IBPA and strangled by the military. 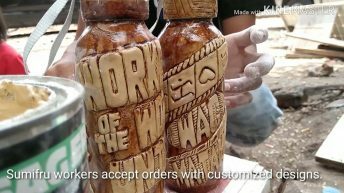 Part of Duterte’s counterinsurgendy program Oplan Kapayapaan is the ‘surrender campaign’, an effort of the Duterte administration to make it appear that its counterinsurgency program is gaining traction by promising alleged NPAs benefits as high as P140,000 under its Comprehensive Local Integration Program (CLIP). 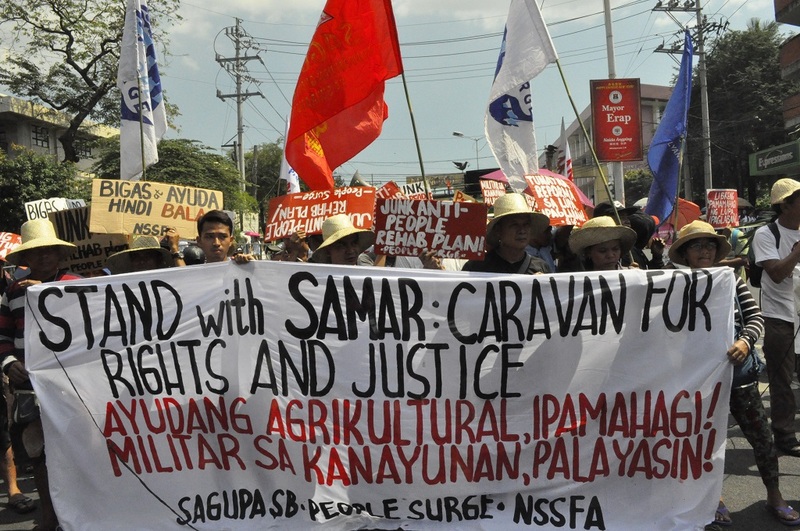 “More fake surrenderees would mean more human rights violations against farmers,” Flores said. According to one of the delegates, the soldiers would demand the farmers to collect bamboo shoots and wood to be used as a fence for the battalion. Every day, the farmers need to reach a ‘quota’ and then sign on a blank sheet of paper in front of the military camp. Upon non-compliance, they would be accused of being members of the NPA. Ironically, they would discover that their signatures would be used as a list of NPA surrenderees. In their hunt for alleged NPAs, the military also make use of children — bribing them with candy and money when asking which houses accommodate NPAs. Some children get accused of being NPA combatants after being spotted by the military while picking up shells of bullets after an encounter. 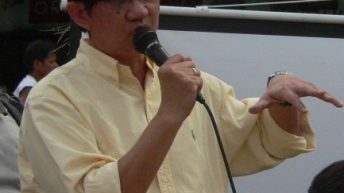 Given their record of human rights violations, it came as a shock to one of the delegates that a streamer advocating for the Comprehensive Agreement on the Respect for Human Rights and International Humanitarian Law (CARHRIHL) would be found in one of the military camps. 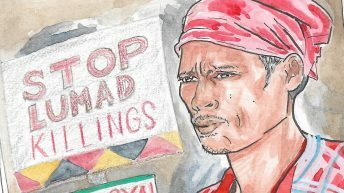 “We do not need to prove that the government is fascist because it is already enough that the farmers have already travelled all the way to Manila to demand the troops to leave, it is enough proof that we have a long list of human rights violations, and Duterte himself is proof of how fascist his government is. Now, its programs are proof that he himself is a fascist — they have Oplan Tokhang and counterinsurgency programs and CLIP that the military implements, and they have done nothing but terrorize the people,” Macallan said in a speech in front of Camp Crame last month. According to KMP, more than 120 farmers have already died for under the Duterte administration. Seven army battalions are currently present in Eastern Visayas. The Duterte administration has recently made a move to create a new army battalion — the 93rd Infantry Battalion to be called “Bantay Kapayapaan” to be based at Camp Eugenio Daza in Fatima Village, Hinabangan, Samar. “We do not need another army battalion to harass, threaten, and intimidate civilians in Eastern Visayas,” says Jun Berino of SAGUPA-SB said. Farmers are actually demanding the immediate pull out of seven other army battalions — 20th, 43rd, 14th, 87th, 52nd, 19th and 78th Infantry Battalions under the 8th Infantry Division operating in the region. 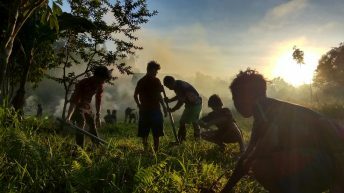 According to Berino, since Eastern Visayas is also currently undergoing problems with infestation of cocolisap and other pests, farmers are forced to relocate to upload farms and hinterlands to seek other sources of livelihood. 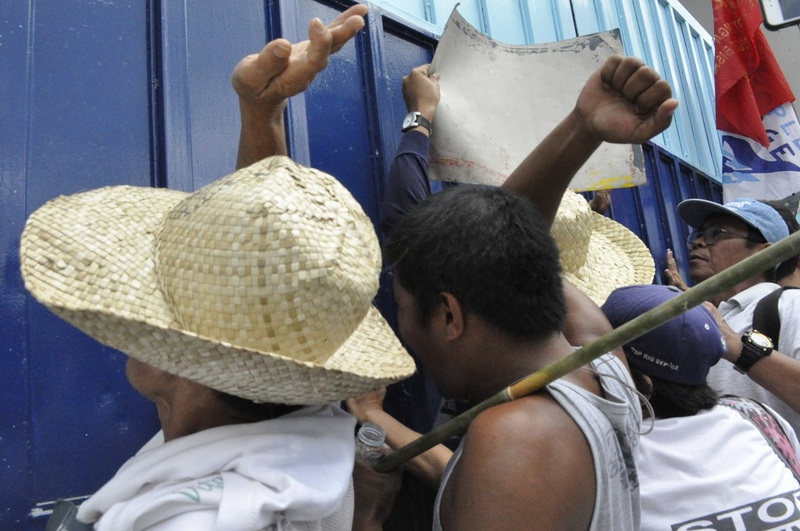 Intense militarization in the province, however, prevents them from being able to move freely and without fear. “Rice, not bullets; rehabilitation, not militarization” is one of the resounding calls of the Eastern Visayas caravan for rights and justice. The situation remains the same in the entire country, as the Duterte administration has previously signified its preparations to create ten additional battalions and intensified its recruitment for the army and the police, in an effort to curb ‘terrorism’ and to boost its counterinsurgency campaign. The cost of counterinsurgency in Eastern Visayas, and even in the entire country, is never justifiable, no matter how much the different administrations would dare say it is for the safety of the people, in combatting terrorism. For if the military, who claim to protect the citizens from terrorists, are the very people who sow terror in the hinterlands and in cities — with a historically accurate record of human rights violations ranging from planted evidence to abduction and torture to brutal killings and black propaganda, whom should we consider the real terrorist?